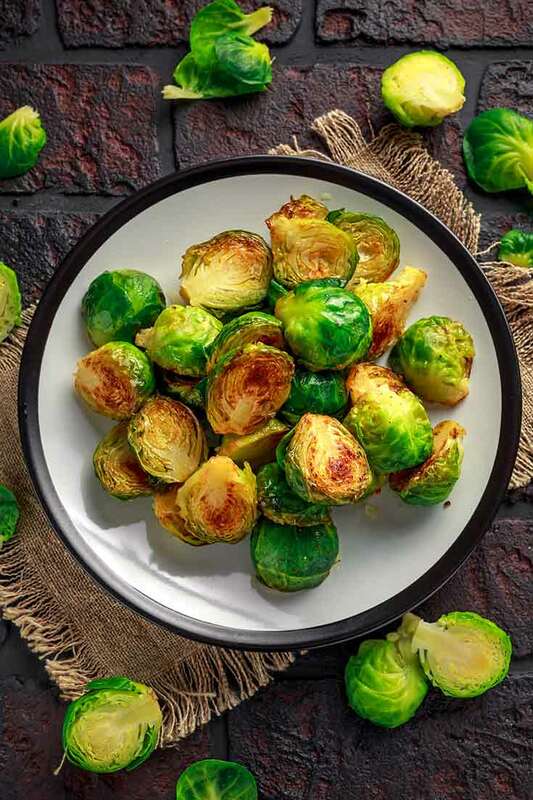 This roasted Brussels sprouts recipe is a fabulously simple and tasty way to prepare Brussels sprouts! I grew up eating Brussels Sprouts. My grandmother would hear nothing of my protests. So eventually, they grew on me. Especially when coated with a pound of butter and half a container of salt. But as I grew older, I began to really appreciate the flavor these little guys can bring to a dish. Now that I’m eating clean, I wanted to come up with a way to prepare them without the pound of butter or gobs of salt. I found a recipe for grilled brussels sprouts online, and decided to adapt the recipe for my oven. In truth, I’m not sure if I really adapted it. More like, subtracted it. I subtracted the grill, the Parmesan cheese, and all of the other ingredients listed as optional in the recipe. I also did not add any pepper. There was no rhyme or reason for this, I just left it out cause I was in the mood to. Feel free to add a whole bottle of pepper is that’s what you like. So here’s my version of this very simple, very yummy side dish. 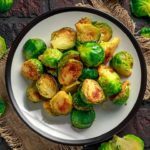 This roasted Brussels sprouts recipe uses no butter or salt, but this easy side dish is clean eating and SO delicious! Place your brussels sprouts in a large colander and wash well. Allow to drip dry for a few minutes. While the brussels sprouts are still in the colander, pour your olive oil and spices over them. Swish around in the colander until the brussels sprouts are well coated. Place your brussels sprouts on a parchment lined cookie sheet. Cover loosely with foil, and place in a preheated oven for about 45 minutes to 1 hour, or until you can easily post the brussels sprouts with a fork. Ashley – I usually cook at 350 for just about everything. Seems to work well for me. Enjoy the hummus! I tried something like this last week and I couldn’t believe that I made Brussels Sprouts taste good. I used Garlic Olive Oil. I ate them for 3 days straight, so good. Are these supposed to be crisp? Mine came out soft and mushy, I shared the oven with a baking chicken breast. I wonder if that had something to do with it? I’m new to cooking and clean eating and your website has provided me with most of my guidance, thanks! Lindsay – I could have been the sharing or you could have just cooked them too long. Mine were not mushy, but they aren’t crisp either. Just cooked.